A wedding day is an expression of soulmates sharing their love and making a promise to honor. A wedding qun kwa include a jacket and skirt. 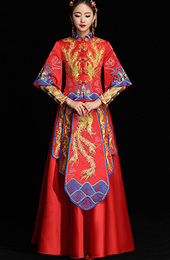 Features traditional Chinese embroidery, frog buttons and mandarin collar.